There are many excellent tools available to test RESTful web services. Applications like Fiddler, cURL, Firefox with Firebug, and Google Chrome’s Advanced REST Client and REST Console are commonly used by developers and test engineers. Another powerful tool, used by many enterprise software development organizations, is soapUI by SmatBear Software. 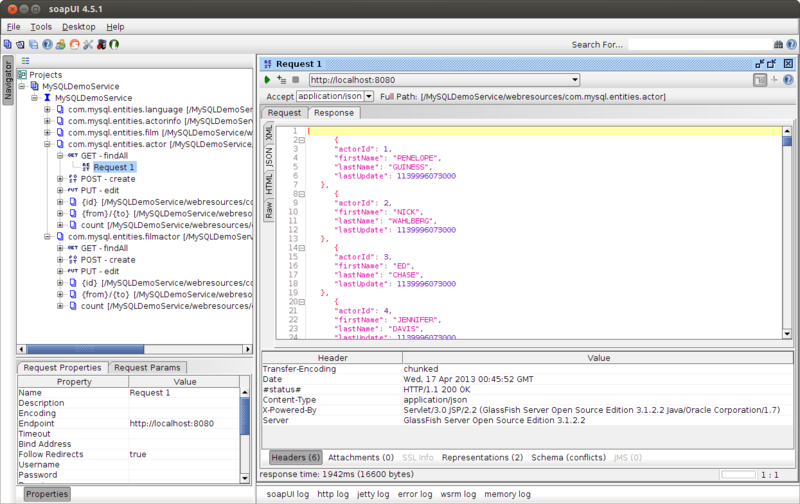 SmartBear offers several versions, from the free open-source edition (shown here), to the full-featured soapUI Pro. Although, soapUI Pro has many useful advanced features, the free edition is fine to start with. Here is a product comparison of the various editions available from SmartBear. 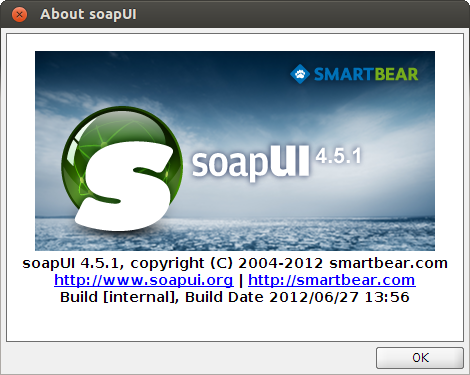 SmartBear’s soapUI is available for Windows, Mac OS, and Linux (shown here). The application supports a wide range of technologies, including SOAP, WSDL, REST, HTTP, HTTPS, AMF, JDBC, JMS, WS-I Integeration, WS-Security, WS-Addressing, WS-Reliable Messaging, according to the SmartBear web site. It is easy to download and install. In my last post, we used JDBC to map JPA entity classes to tables and views within a MySQL database. We then built RESTful web services, EJB classes, which communicated with MySQL through the entities. 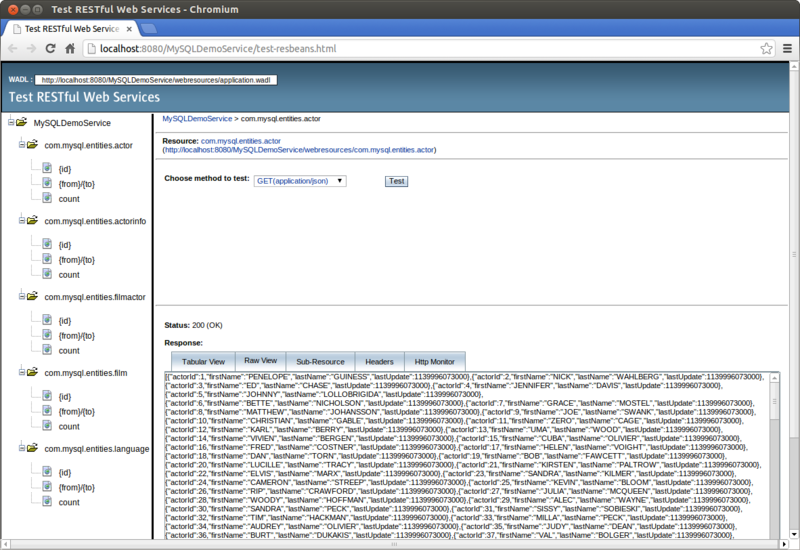 The RESTful web services, part of a Java Web Application, were deployed to GlassFish. Using that post’s RESTful web services, here is a quick example of how easy it is to use the free, open-source edition of soapUI to test those services. Start by locating the address of the RESTful service’s WADL. The WADL address is displayed in the upper left corner of the NetBeans’ browser-based test page, shown in the earlier post. Next, create a new soapUI project. Give the project the WADL address and a project name. 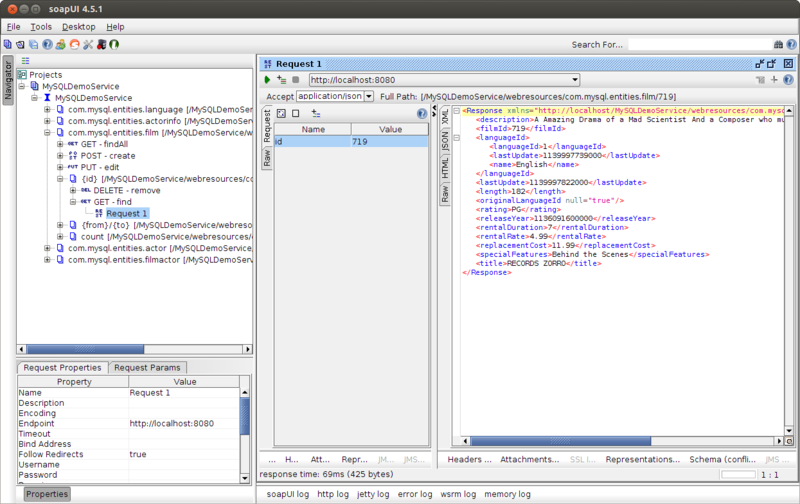 Using the WADL, soapUI will create sample HTTP Request for each service resource’s methods (left-side of screen). Populating the sample request with any required input parameters, you make an HTTP Request to the service’s method. In this first example, I call the Actor resource’s ‘findAll’ method using an HTTP GET method. 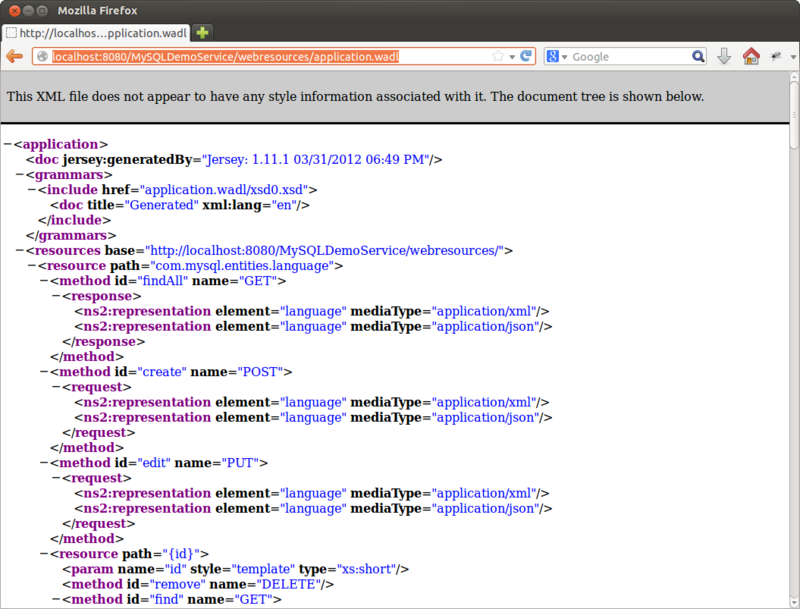 The call to ‘http://localhost:8080/MySQLDemoService/webresources/com.mysql.entities.actor’ results in an HTTP Response with the list of Actor objects, mapped (serialized) to JSON (right-side of screen). In this second example, I call the Film resource’s ‘Id’ method, to locate a single Film object, using the HTTP GET method. The call to ‘http://localhost:8080/MySQLDemoService/webresources/com.mysql.entities.film/719’ results in an HTTP Response with the a single Film object, identified by Id 719. This time the object is marshalled to XML, instead of JSON. This entry was posted on April 16, 2013, 9:24 pm and is filed under Java Development. You can follow any responses to this entry through RSS 2.0. You can leave a response, or trackback from your own site.